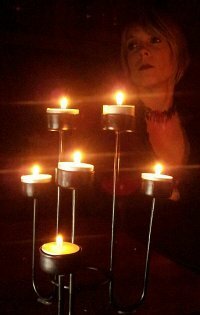 Your In Fear of-episode Scotomaphobia: Fear of Blindness - in a few words, what is it about, and what can you tell us about your character in it? Firstly, thank you so much, Michael, for this opportunity to share with you, and others, my life in film. It�s an honor. 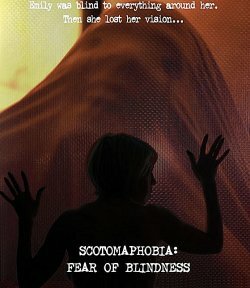 In the short film In Fear Of - Scotomaphobia: Fear of Blindness, I play the role of Emily, a woman whose entire life is crumbling, but not just due to her loss of sight. Her problems stem from bad decisions and fateful circumstances of her past and present. She seeks comfort by escaping, but she does it in very risky and dangerous ways. Her eyesight is failing and she becomes withdrawn into her own head which is full of personal demons. How easy or hard was it for you to play a blind person, and what did you draw upon to bring your character to life? The fear of blindness - is that a fear you can at all relate to, and what are you afraid of in your personal life? How did you get hooked up with the project in the first place, and were you at all aware of the series prior to your involvement? I was fully aware of Scott Perry's [Scott W. Perry interview - click here] amazing In Fear of-series and was delighted when Jeremiah sent me an outline of the screen story. I'm not even sure if I read it yet when I immediately agreed to play Emily. I worked with Jeremiah before on set of Alan Rowe Kelly's The Blood Shed [Alan Rowe Kelly interview - click here]. But I believe I met him when I organized a horror filmmaker�s networking group called Mingle Mangle: Horror Filmmakers and Fans. And coincidentally, I also met Scott Perry on the set of The Blood Shed and he attended Mingle Mangle events too. Do talk about your director Jeremiah Kipp [Jeremiah Kipp interview - click here] for a bit, and what was your collaboration like? If I recall, Jeremiah scheduled at least 2 rehearsals. One rehearsal was at a cafe in New York City where Jeremiah guided Bryant Pearson (who plays Emily�s husband in the film) and me in our roles. He also had us question each other about our characters and a background was developed. Jeremiah is a wonderful director. He is also an actors� director. He knows how to bring out my best performance. Even for the extras, he knows how to loosen them up and prepare them for the rolling camera. I do take a lot of my own experience to the set, but Jeremiah understands how an actor works and he also has the patience to get what he needs on camera and also what the actor needs to do their best. I felt that everything went smooth ... except when the cops told us to get off an old overpass at an abandoned prison site. But that didn't stop us for filming the scene somewhere else. I felt very comfortable with Jeremiah, Scott, and Steven-Mark Glassner (DP) [Stephen Mark Glassner interview - click here]. They are all great to work with. You also star in a segment of the upcoming anthology Blaze of Gory - so what can you tell us about that one and your character? The segment in Blaze of Gory that I perform in is called Snow. It's a modern day version of Snow White. I play the evil step mother ... like the evil queen. Blaze of Gory is a collaboration of shorts made by different filmmakers, but all written by a young pre-teen girl, Blaize-Alix Szanto [Blaize-Alix Szanto interview - click here]. It's produced by David V G Davies [David V G Davies interview - click here] who also directed the Snow segment. Vikki Spit plays the Snow White character. 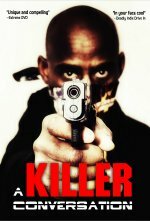 It also stars Lord Zion and Duff Eynon. I really enjoyed working with each and every one of them. As far as I know, you play a villain in Blaze of Gory - so how easy or hard was it to get in touch with your dark side? Oddly, this Buddhist feels comfortable playing evil. I'm not sure why. Maybe I'm just a ham! Or perhaps it�s just fun being someone else for a change. I do, however, give these dark characters some vulnerabilities with a background and reason for their behavior. Another not-so-nice character I play is the mother in another one of Jeremiah's projects called Berenice. 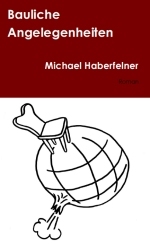 This character has strange intentions for the sake of money� and uses her son as a pawn. How did you get involved with the project in the first place, and what can you tell us about your collaboration with your director David V G Davies [David V G Davies interview - click here]? I met David in 2008 at a Dark Carnival Film Festival in Indiana. He flew all the way there from England. We eventually became Facebook friends and when I saw him post a casting notice about a film to be shot in Norway, I simply commented that some people think I look Norwegian. Before I knew it, he sent me the script and I said "YES!" We shot in the snow and in a cabin in the woods of Norway for 2-3 days and then I toured the rest of the country by myself! What a great time - shoot and all! As far as I know, your segment of Blaze of Gory was filmed in Norway - so do talk about filming in the cold of Norway for a bit, and what were some of the challenges? ... perfect segway! ... but I will shorten our adventure for you: Our car got stuck on the ice on a steep road in the middle of the night. We had no electric or running water. We used snow to make tea. We had to tend to the fire all night � and we had tons of fun! And everyone was a trooper! With all that stress, not one altercation happened between cast or crew. Everyone took the conditions in stride and genuinely respected one another. I'd work with them again for sure ... even in those conditions! Besides finishing Berenice (a short based on an Edgar Allan Poe story for an anthology of Poe films), I was also in a film called Case at Midnight. I played the role of Genie Stern, a female Geraldo-type journalist who interviews the notorious Charles Rainer, who heads a murdering and weapon dealing cult of crazed � 80�s chicks! I always loved to act. I took a drama class in elementary school and eventually in high school, which led to the high school plays. I also took classes in college and a few years after I graduated, I continued my acting studies in New York City at schools like Herbert Berghof, Weist Barron, and The Upright Citizen's Brigade. Most of my training was the Stanislavski Method, but I only tap into it when I need to. I think it may have been a Montclair State College comedy skit by Nate Kean about Claus Von Bulow. I played the comatose wife who they carried into the courtroom to testify. I was just sprawled out unconscious on a table. I had a ball doing comedy in college! Besides acting, you have also occasionally tried your hands on writing and directing - so what can you tell us about those experiences of yours? Thanks for bringing that up. I�m actually a full time real estate agent, but I still want to continue to make films. I made two short films, Illusion of Reality and Mavi Goz. Illusion of Reality was a film done on Super 8 in a college film class. It's a bizarre little film that I made when I was inspired by Maya Deren's Meshes of the Afternoon. Mavi Goz was my first film out of college. I wrote, produced, and directed it. Oh, I was the lead as well. Who else could I trust not to cut their hair, lose or gain weight, get a tan, or ... just be available ... for the many months I shot it. It's about a young woman who is visited by a Turkish neighbor who gives her the glass Evil Eye pendant. This soars the character back into her past remembering all her psychic occurrences. Under the Raven's Wing was my first feature. 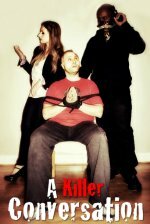 I shot it documentary style ... as if shot by a cocky male filmmaker interviewing three young women who committed a murder. They have a warped philosophy and feel that they didn't kill... but they SAVED. Quite a few of your movies are of the horror variety - coincidence, or is horror a genre at all dear to you, and why (not)? I love acting no matter what the genre. However, regardless of my training, I don't pursue acting. I never really did. Honestly, I think my headshot is from 2003! I got involved in one horror film and with the help of my Mingle Mangle Horror Filmmakers and Fans (2004?) networking group, I was cast in many more. Then friends and friends of friends cast me and I've been busy since. How would you describe yourself as an actress, and some techniques of yours to bring your characters to life? As I mentioned, I studied The Stanislavski Method at HB Studios with an old Russian woman who screamed all the time. "No more pamsy mamsy! No more pamsy mamsy!" But she whipped our asses into shape. I don't usually use the Method though, unless it is an extremely emotional scene. Another method I use is to allow "the outer" to control "the inner". For instance, wardrobe. When I dress the part, it helps. Even if my shoes are not in the shot, I wear shoes the character would wear. It makes me FEEL like that character. Another example is I clench my hand tight and shake it hard before an emotional scene. You�re welcome! And thank you, Michael. I enjoyed the interview.